He tweeted a picture of himself holding a sign saying, "I did not score two triple centuries, my bat did." It has been retweeted more than 20,000 times and received 33,000 "likes" since then, with many, including Bollywood actor Randeep Hooda praising the tweet. However, others have condemned what they have called "bullying". Why are Indian women being attacked on social media? 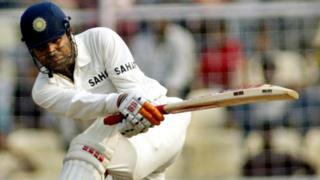 The timing of Sehwag's tweet has also been called into question, given the level of abuse Ms Kaur has been facing for her campaign against the Akhil Bharatiya Vidyarthi Parishad (ABVP), a right-wing student union, following a clash at Delhi University's Ramjas college. The Delhi commissioner for women has directed the police to provide her with protection following the nature of abuse directed against her. They have also directed the police to initiate criminal action against those targeting her online.